Review posted January 19, 2018. Harmony Books, 2017. 257 pages. The Four Tendencies is an interesting approach to motivation. It really does seem to work for me – though I’m the same tendency as the author. I was discussing it with friends on Facebook, and some think it’s a little too simplistic, but of course you’ll get more nuances if you read the book. Here’s the basic idea: People are divided up by whether they meet or resist outer and inner expectations. Within this framework – which she definitely doesn’t claim is the last word on someone’s personality – she gives tips about how to motivate someone from that type. 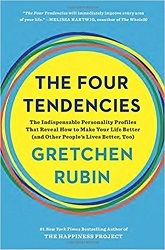 I agree with the things she says about my tendency – an Upholder – but where the book is helpful is helping me see why what motivates me (“Just do it!”) doesn’t necessarily work on others. This book actually explains a lot about some things that went wrong in my interactions with my ex-husband, who I believe is the opposite type. And it sheds light on why the ways I tried to motivate my kids often didn’t work. The main question this book is trying to answer is “How do I get people – including myself – to do what I want?” It’s a book about motivation. Knowing other people’s Tendencies also makes it much easier to persuade them, to encourage them, and to avoid conflict. If we don’t consider a person’s Tendency, our words may be ineffective or even counterproductive. The fact is, if we want to communicate, we must speak the right language – not the message that would work most effectively with us, but the message that will persuade the listener. When we take into account the Four Tendencies, we can tailor our arguments to appeal to different values. On the other hand, when we ignore the Tendencies, we lower our chances of success. The more an Upholder lectures a Rebel, the more the Rebel will want to resist. A Questioner may provide an Obliger with several sound reasons for taking an action, but those logical arguments don’t matter much to an Obliger; external accountability is the key for an Obliger.